Web 2.0 and the commercial interest in open-source software both reflect a current trend towards increased user involvement in product and service development. To stay competitive in this era of open innovation, companies must learn to trust users as codevelopers and to make use of the Web as an instrument for identity cultivation. A fundamental question in relation to the success of these emerging gift cultures is what motivates people to contribute time and knowledge without any apparent return, at least not in the immediate monetary sense. According to economists Josh Lerner and Jean Tirole, the two major motivations are career concerns and ego gratification, which they collectively refer to as the signalling incentive. By contributing to a Web community people gain reputation and status within that community. Creating and maintaining ones identity and social status thus appears to be the main driving force of these emerging phenomena. A successful company must show commitment and build a strong corporate identity to attract people (ie visitors), and an individual must commit fully to a community in order to build a strong personal identity: both are motivated by the signalling incentive. Hence, while personal identity is important to oneself, it is also important to others in order for them to recognize ones contributions. In a similar vein, individuals personal identity yis important to corporations in order for them to recognize the characteristics and needs of their customers, and to tailor their own Web presence, thus building their corporate identity. However, while identity and recognition are important on the Web, the flipside of the identity coin is that of personal integrity. Consider the following story for example, which was reported in The New York Times. Last year, a team within AOL publicly released search data of more than 650,000 users. Although actual user names were replaced with random numbers, it was possible to track all the search terms used by a given individual, and thus to physically locate that individual. Apparently, No. 4417749 conducted hundreds of searches over a three-month period and eventually the data trail led to Thelma Arnold, a 62-year-old widow in Lilburn, GA, who confirmed the searches were indeed hers. Shortly after this report, AOL removed the search data from its site and apologized for its release, but the detailed records continue to circulate online. The story does not reveal whether or not Ms. Arnold benefited from her strengthened identity in this particular community. However, the example clearly illustrates that some of the traces we leave on the Web are less intentional and probably less ego gratifying than we would wish. The aim of this research is to increase our understanding of how the Web is used as an identity creation system, both for individuals and corporations. We have analysed the use of Amazon.com from the perspective of identity creation based on how and with whom we communicate when using such a system. This includes the importance of considering both the intentional actions of users and the traces left behind by those actions. The traces we leave behind, both knowingly (such as when reviewing a book) and unknowingly (by merely using the underlying technology of the Web infrastructure) are the foundation for our Web identity. In order to take advantage of the signalling incentive, a Web site therefore needs to provide users with instruments that allow them to develop a proper understanding of their online conversations and their contribution to the development of their own identity. We refer to this as the principle of identity cultivation. 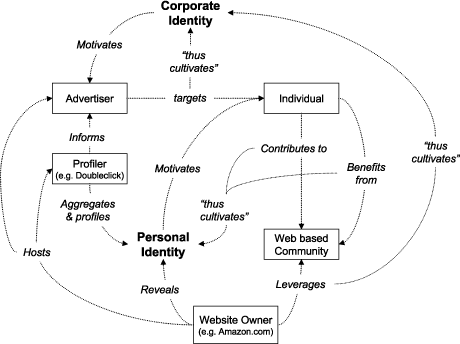 Figure 1: Main concepts and relationships relevant to identity cultivation on the Web. Striving for recognition in some community thus motivates users seemingly altruistically to contribute to the development of the value of Internet services. In the quest for strong corporate identity, Web 2.0-aware companies, such as Amazon.com, are building their services around user engagement. This attracts people to their Web site and engages them in the codevelopment of the site, which in turn gives Amazon.com a strong corporate identity. This strong identity and the large number of committed visitors also makes Amazon.com an attractive platform on which third parties can build their identity through personalized advertisements. This has an impact on our view of the Web from a design perspective: we need to acknowledge multiple interests and the implications for gathering, storing and utilizing information about both intentional user actions and the possibly unintended traces left behind. For more details on this study, see the paper Sowing the Seeds of Self: A Socio-Pragmatic Penetration of the Web Artefact, which recently won the Best Paper Award at the 2007 International Conference on the Pragmatic Web (http://www.pragmaticweb.info). The paper is available from the authors on request and from the ACM digital library (http://www.acm.org/dl/).